The recently developed Quintrex Frontier range is squarely aimed at serious fishers. The design of all the boats shares the Apex hull form that maximises space within the overall dimensions and has ride and stability advantages. The side console layout allows the location around the small console of three supremely comfortable swivel seats, socket mounted, and all fitted with bolsters. A socket on the platform allows one to be relocated to choice, but in the basic position the passenger mass provides perfect trim. These passengers also get the best possible ride the 550 can provide. We gave the Quintrex the hardest workout the 115hp Mercury four-stroke and the gentle to medium sea conditions could deliver. There is no question that the ride is right up there with the best boats in its size range. The seats definitely assist this, but that trickily shaped hull is pulling its weight. This is a boat for getting you out there and back briskly but, equally, it is one for sheltered waters. This is a born bream competition boat, or more socially a crabber. Even with all the seats in place there is plenty of manoeuvring and stacking space; which of course would be equally handy in a crayfishing role. All the potential tasks are made easier and safer by the 550’s exceptional stability. The console is moulded in plastic rather than constructed in aluminium. Fair enough: use the right material for the job - light and aesthetic. It is distinctively minimalistic, with a simple grab rail where you might expect a windscreen. If you stand and use the bolster whatever windscreen fitted will have zero effect anyway, so the driver shares the wind with the passengers. The semi punt style hull – although with endlessly sophisticated surfaces - provides several desirable features for fishers, deck room and stability being two of them. The pointy end is less pointy than a traditional hull’s, meaning the bow platform has good area. Also good underdeck volume for stowage of bulky items; bulky rather than heavy in this weight sensitive part of the boat. A rare and welcome feature of these lockers is they are actually lockable. Very handy in camping grounds or roadhouse parking lots. Stowage generally is well provided for. There are two insulated under deck lockers capable of service as slurry tanks, ice boxes or dry storage. There are also capacious side pockets and a small amount of room within the console. The review boat’s hull had been given a vinyl wrap finish rather than the standard paint. A matter of personal taste, but it does have an interesting side benefit: damage to the vinyl can be easier to repair than damage to paint. 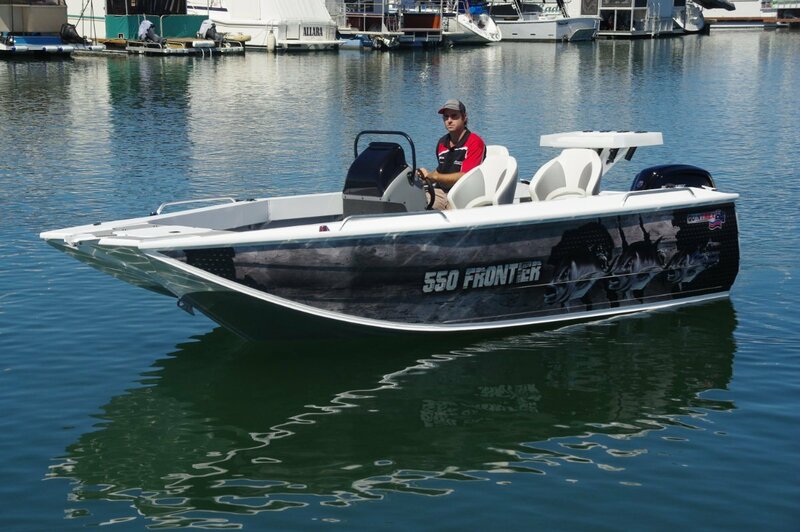 The 550 has features of benefit to inshore as well as offshore fishers. Both schools will appreciate the high freeboard – far further up the thigh than on other similar size Quintrexes. They will both like the bait board – its Quintrex name gives the clue: the Mega Chopper. The dual battery system, though, will especially endear itself to the offshore crowd. One thing about the old two-strokes was they were capable of being hand started. Hand start a four-stroke? Forget it. 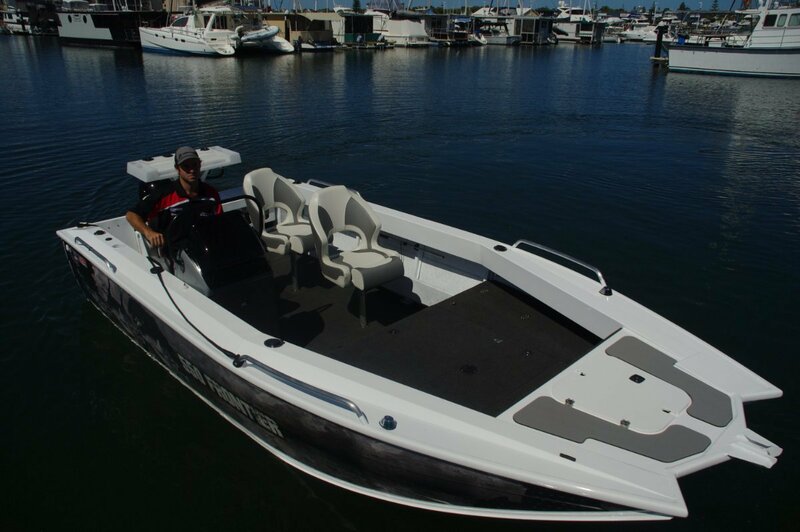 Finishing off the fisherman friendly features are lowset side grab rails and a Lowrance combo. Although perhaps the sealed deck is another: fish hooks and other metal debris lodged in crannies eat aluminium. Catch and release has become an established angling practice, but catch and release boat trailers have caught on to a much smaller extent. Certainly there is a noticeable cost involved, but the ease and convenience far outweigh it; this is single handed drive-off, drive on. 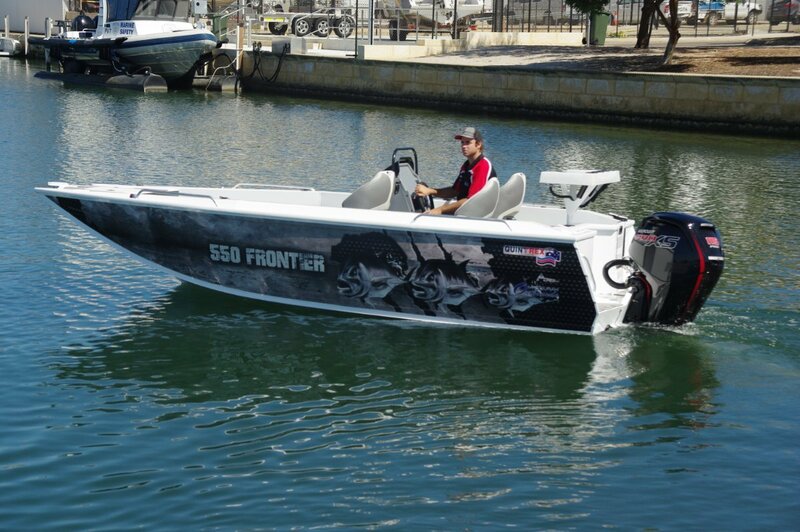 Quintrex dealer Mandurah Outboards had fitted one of the devices to our aluminium trailer and I loved them for it. There are people whose time afloat is marred by the thought of getting back on the trailer; this makes the whole day good.